The ConforMIS knee resurfacing system was introduced in approximately 2008. Up until this point, knee replacements including partial knee replacements or total knee replacements relied on pre-made implants that were implanted at the time of surgery. A surgeon often had to make a decision whether to place a component that was either a bit too large or a bit too small in a patient’s knee because a proper size was not available. The ConforMIS system utilizes a preoperative CT scan to make an image of the knee off of which the actual knee replacement components are individually manufactured. Thus no two patient’s knee replacement components are exactly alike. As you can tell from feeling your own knee, there is a lot of variability among anatomic shapes and sizes of the knee. 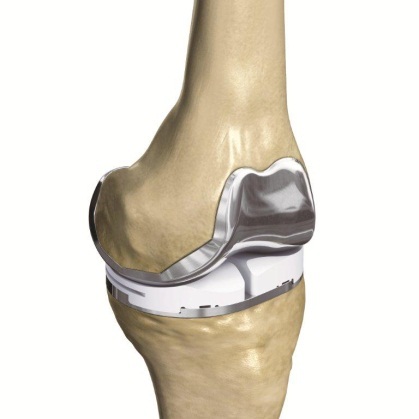 Currently, most knee replacement manufacturers offer what are called custom knee replacements. These replacements, however, are not patient specific implants but instead rely on patient specific cutting blocks which are applied to the knee at the beginning of a knee replacement procedure to make an initial bone cut. Following this, the standard instrumentation is used and ultimately off-the-shelf pre-made components are placed into the knee. The only system that offers a truly patient-specific implant is the ConforMIS system. To date, Dr. Snyder of the Orthopaedic and Spine Center has performed almost 500 partial and total knee replacements utilizing the ConforMIS system. In fact, when Dr. Snyder had problems with his own knee, he went to Boston and became one of the first patients nationwide to have a partial knee replacement using the ConforMIS system. The ConforMIS system offers major advantages over traditional knee replacement systems in that primarily only the affected area of the knee that is involved with arthritis needs to be replaced. This results in smaller bone cuts, less pain and a faster recovery. For more information, or to make an appointment with Dr. Robert Snyder, contact the Orthopaedic and Spine Center at 757-596-1900.